In my B/X house rules, any class can wear any kind of armor. There are, of course, trade-offs though. Encumbrance is the primary penalty from wearing armor, and this applies to all classes. I use the LotFP encumbrance rules, modified slightly to allow characters with exceptional strength to carry more. Fighters are, practically speaking, likely to have higher strength than other classes, so this also in effect makes them less likely to be penalized for wearing armor (though clearly this will vary on an individual basis). To maximize mobility, a prudent fighter will not carry much other than armor and primary weapons. Squires or porters can be hired to carry extra weapons and other equipment. Wearing any kind of armor interferes with the delicate gestures required for a magic-user’s spell casting. The following chance of spell failure applies: leather 1 in 6, chain 2 in 6, plate 3 in 6. If a prepared spell fails, it is not lost, but the round is wasted. The same goes for casting from a scroll; the scroll is not consumed. Armor heavier than leather also interferes with the following thief skills: move silently, hide in shadows, climb walls, and legerdemain. Wearing heavier armor introduces a chance of failure: chain 1 in 6, plate 2 in 6. Elves (or their human class variants, fighting magic-users) are not subject to spell failure when wearing armor. Faerie creatures such as elves are, however, not able to use mundane metal armor (such as armor of iron or steel) because close proximity of metal pains them greatly. They may use specially forged faerie-metal armor, which can only be procured in faerie realms. Elf armor tends to degrade if it spends too much time outside of elf lands, however. Dwarves are known for crafting durable faerie armor, but their prices tend to be steep and not just in terms of money. Dwarf-made armor is thus highly prized by elves that must journey in the sunlit realms. This entry was posted in Uncategorized and tagged combat, magic-user on February 19, 2012 by Necropraxis. I have thought long and hard on the topic of armor restrictions. Ultimately, I like fighters to really stand out in combat so I think penalties are in order for non-fighters. I like your proposal about spell failure but I’d make it more severe. Instead of wasting a round, I’d say the spell slot is fouled for the day. Otherwise, you’d see most wizards in Plate & Shield. Dragon Warriors does a nice job of this. Any class can wear any armor, but the penalties are really stiff, for both combat rolls and spell failure. Only a Knight can wear plate without penalty. Even Barbarians received a penalty for wearing platemail. I think I will need to see my rule in play to really decide. I have a hard time seeing a magic-user preferring to wear plate mail most of the time though. Their spells would be failing 50% of the time! And they still won’t be able to fight worth a damn. In that case, why not just play a fighter? Also, I would rule that they need their hands free to cast a spell (exceptions perhaps for obviously arcane implements like a wand or a staff), so magic-users would not be able to use shields while casting. I tie armor to con scores (or equivalent) in my games, so that if you have a high enough Constitution you can even wear platemail. I really like the d6 spell failure mechanic you presented. The only thing I would add is to thumb through the spell list and pick out which spells require somatic components and those that do not (those that spell failure does not apply to.) It’s always interesting to see what spells people single out as requiring gestures, burning hands is an obvious one but what about invisibility or protection from X? Would you apply the same guidelines to fighters? That is, would only fighters with a high constitution be able to use plate effectively? I’ve personally been trying to de-emphasize ability scores because I don’t want players to feel like they need high ability scores to have viable characters. 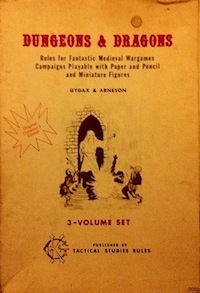 I think that the mechanical focus on ability scores was one of the biggest missteps of AD&D. I also think it opens the door to character build optimization. So for those reasons I probably wouldn’t tie armor directly to constitution. But some people really like using differentiation by ability scores and I realize that reasonable folk can differ here. I have tended to assume that all spells require both gestures and words, which simplifies things. Though, when you think about it, it does sort of conflict with the Vancian idea of cramming alien algorithms into your head. The chanting and gesturing model does seem to work better for D&D class balance though. Let’s see if I get the right reply button this time. For me, part of being a fighter is being able to wear all armor and use all weapons so the requirement is waived. I mainly use it so that if one wants to play as an armored mage, or if their hobbit wants to throw on chainmail for a major battle they can provided they have a decent constitution. I’ve been heading the opposite direction myself actually. I’ve begun to see ability scores as the very first description of your character so I’d like them to matter more. I understand your reluctance though, especially if you’re used to ability score inflation of newer editions. I’ve been trying to stay cognizant of that when I tie in ability scores, such that one does not feel obligated to have a high ability score. That is the easiest way to do spells, although with exceptions for things like Power Word of course. If you do get a chance though by going through the spell list and deciding whether one uses gestures or not really makes you think about how a spell is cast and how people in the world look at wizards. If sleep does not require gestures then people would be very awed by a wizard who could drop a drunken oaf with but a mere syllable. If there is a lot of hand waving people might mistake them for performers. It also helps with imagery for the players if they see him wiggling his hands and they know that say any destructive (evocation) spell requires complex gestures. On the flip side, if the wizard can polymorph, assume gaseous form or blink with but a word they’ll be more wary of letting a bound wizard get away. I think this calls for a series of tables to randomly determine requirements for specific spells. The first time a spell is cast, all the details could be rolled up and recorded for future reference. No prep required. You can always use a system like Diablo II, where armor has a strength requirement. Most of the Sorceresses in D2 used Tal Rasha’s Plate, which (if it had no requirement reduction) would have been lacquered plate with a Str. Req. of 200 or so. This is about an 18(00) in classic D&D numbers. I think if your strength is high enough, you should be able to wear just about anything as a spellcaster. I use this system now, and it works great, as character creation is no longer just about loading up your prime req’s with the 18’s.